This winter I was itching to do something creative just for myself and so I started tossing around some ideas. 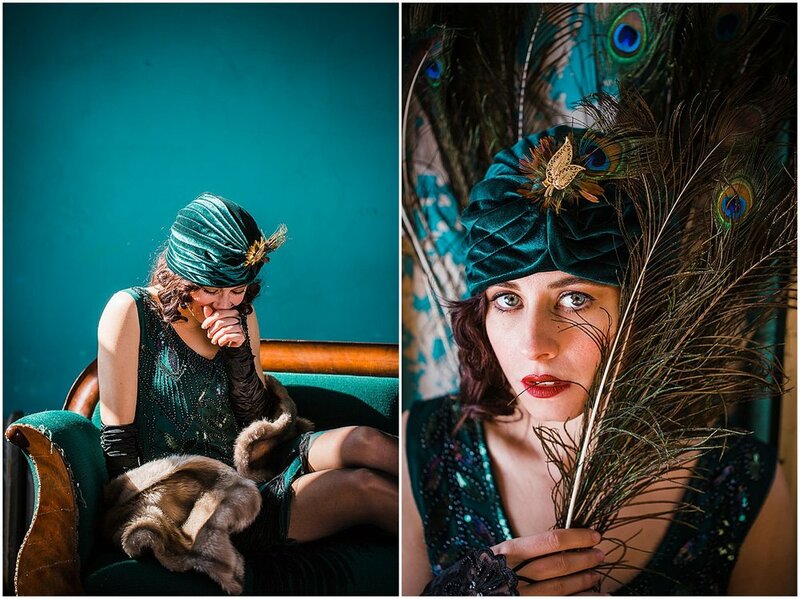 After much contemplating I ended up with this vintage peacock flapper inspired glamour session with my new friend and fellow creative Rachel as model. Rachel has this vintage vibe about her (she also collects vintage clothing) and I thought she would be perfect for this. I love jewel tones, especially peacock colors, and so naturally I was drawn to this room with a teal wall above Realm and Reason Shop in Lancaster City. 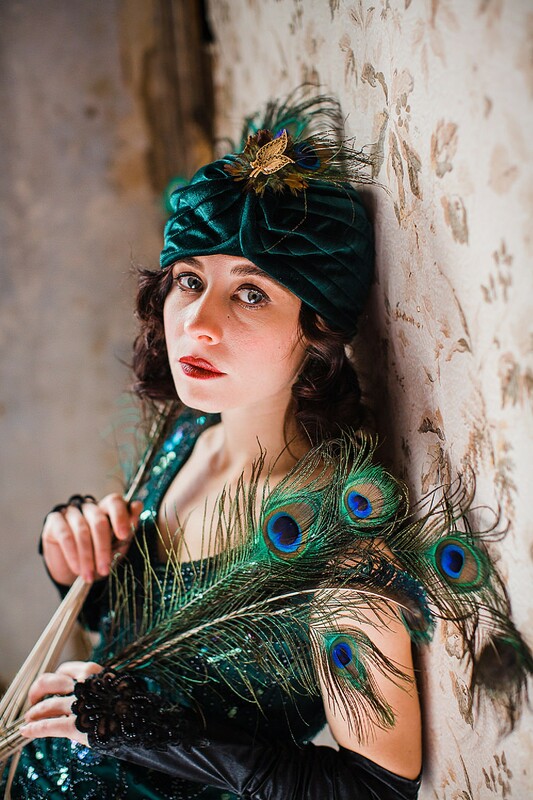 The idea for this vintage flapper inspired glamour session began when I decided I wanted to dress up fancy for a friend’s New Year’s Eve party. I had ordered this awesome flapper dress on Amazon only to end up with my first ever emergency room visit on NYE due to what I thought was a bone stuck in my throat (thankfully turned out to be nothing) which meant no NYE party for me. 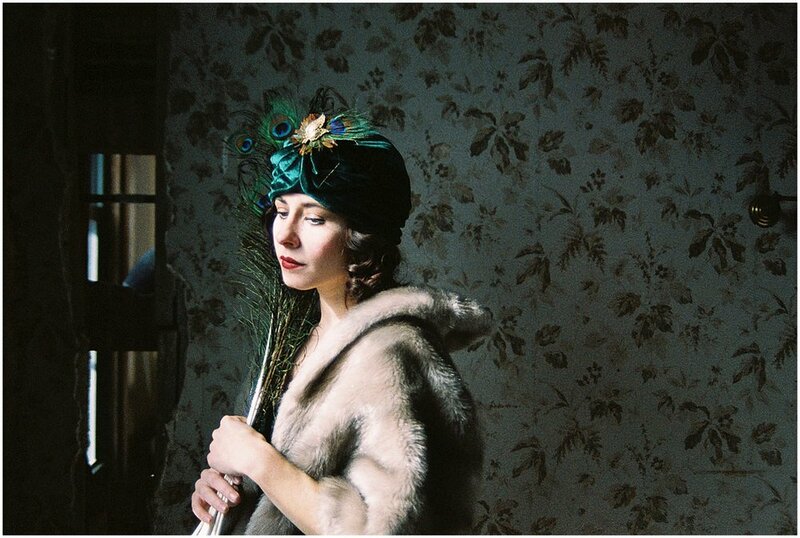 I also happened to have a ton of peacock feathers on hand from my wedding back in 2012. We made our own bouquets and used some of the feathers in them. 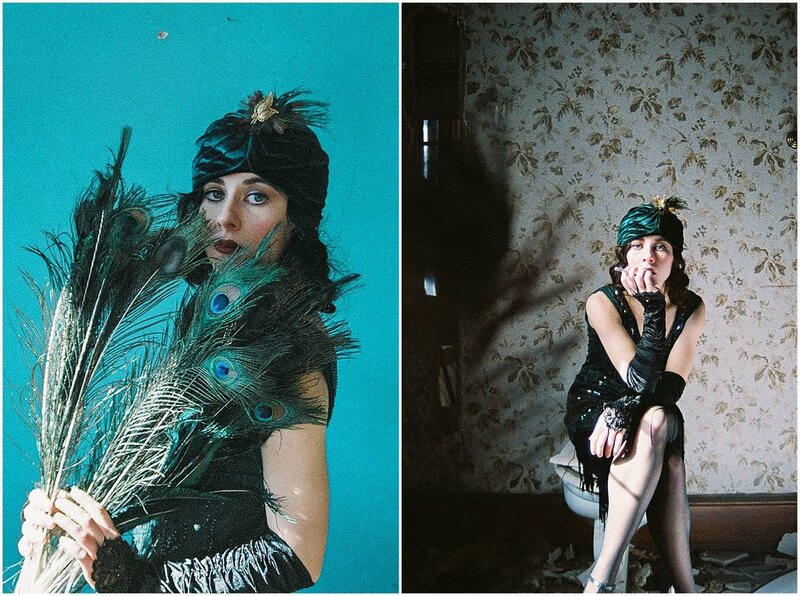 They complemented the flapper look perfectly and I had fun holding them in front of the lens to create some additional depth and color. We had a limited time window for this shoot since it happened during the 2 hours my daughter was in preschool. I managed to not only shoot digital but also shot a roll of 800 speed Kodak film that was more than 10 years old on my Canon AE-1, my very first camera which functions completely manually. If you scroll down to the bottom of this post you’ll probably be able to tell which images were shot on film. I have so many favorites from this session that I found it hard to narrow these down. These are the colors of my soul! The light was gorgeous that morning, pouring in through the windows. Rachel was getting over a bad head cold but you can hardly even tell in these photos. She was a real trouper and even smoked a cigarette and sat on an old toilet for some of the shots. 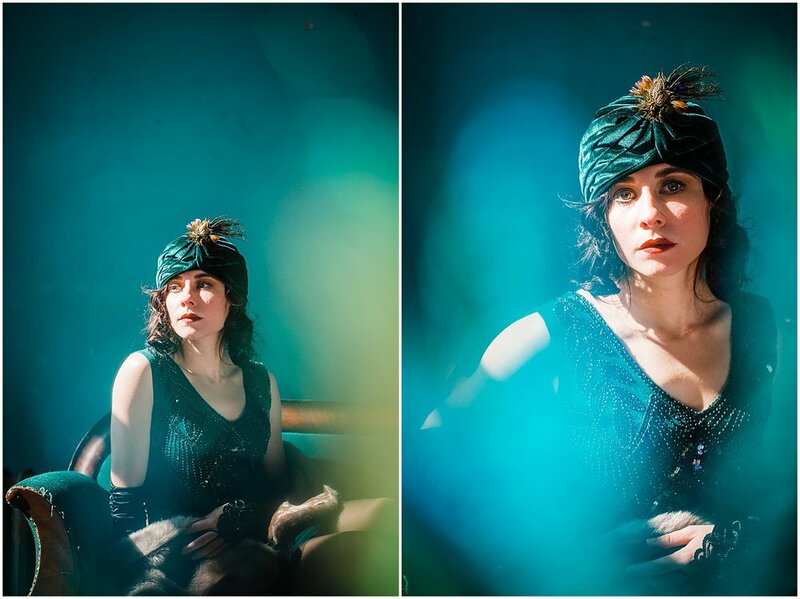 The room with the peeling floral wall paper was also a perfect setting for capturing Rachel’s vintage flapper essence and I enjoyed messing around with some freelensing there too. 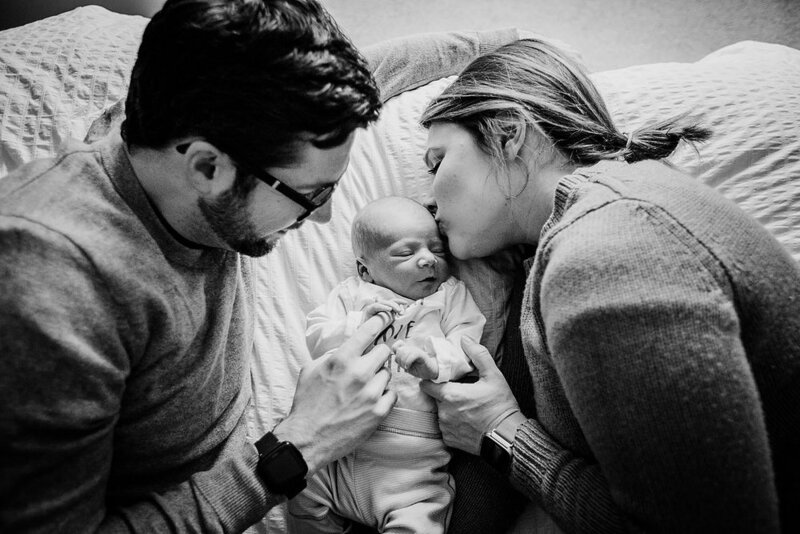 Melissa Engle Photography offers portrait and lifestyle photography in Lancaster, PA. Please contact me if you would like to make some photo magic together! Say hello to baby Henry! 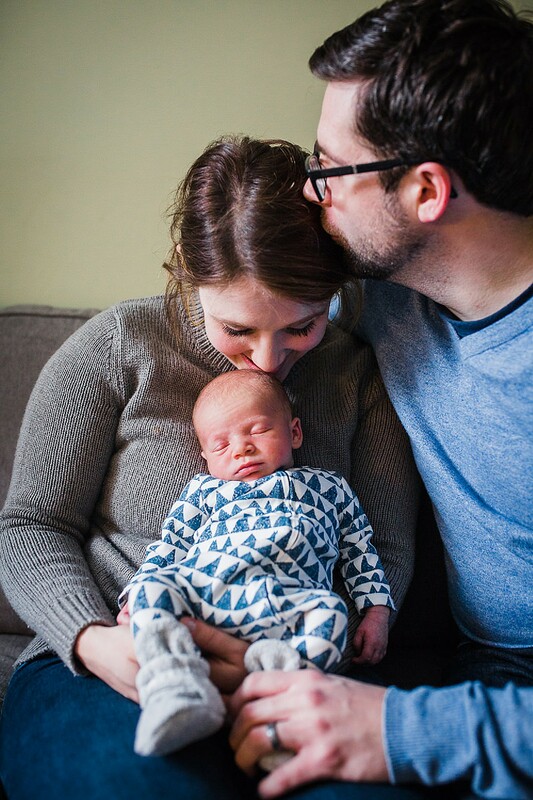 This was my first newborn lifestyle session of 2019 and it could not have been more perfect. 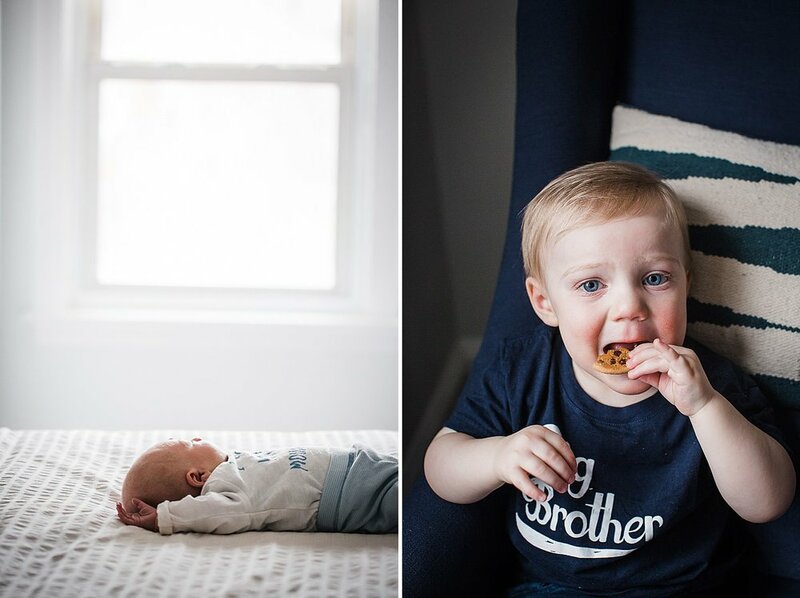 It took big brother Oliver a little while to warm up to the strange lady with the camera, but once he did he was excited to show me his toys and how much he loves chocolate chip cookies (me too!). 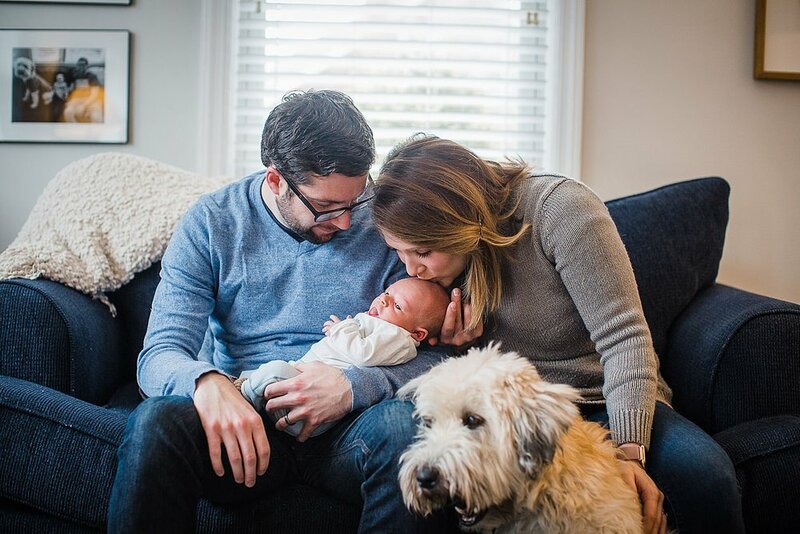 I love that the family dog was even able to pose for a few photos and give baby Henry some puppy kisses. 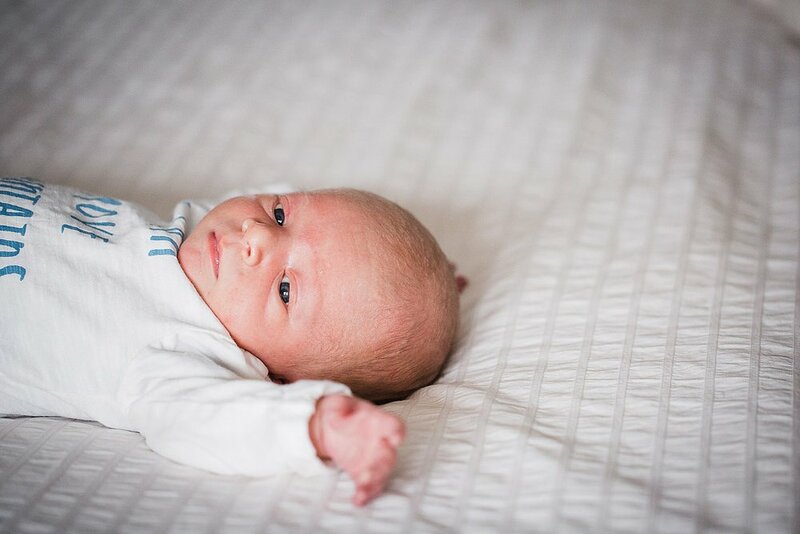 I have to say, baby Henry made my job as a photographer pretty darn easy. He was alert and happy pretty much the entire time and even dozed off for a little while towards the end before pushing out a big poop, newborn style. 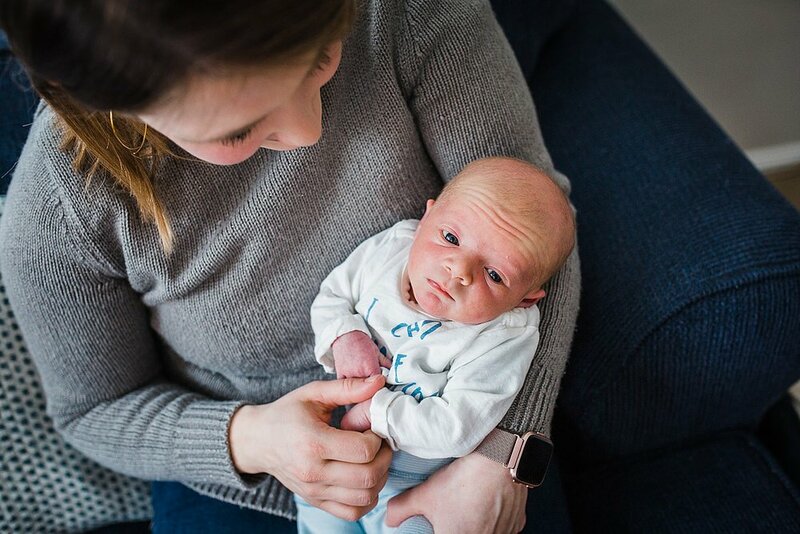 And look at his little forehead wrinkles! I am looking forward to photographing many more newborn lifestyle sessions in the near future. I know for myself as a mom those first few weeks can feel like such a blur and then you blink and your baby is not so tiny anymore. I am so very thankful for the images I have from our newborn lifestyle session when my son was a few weeks old (he turns one this month!). 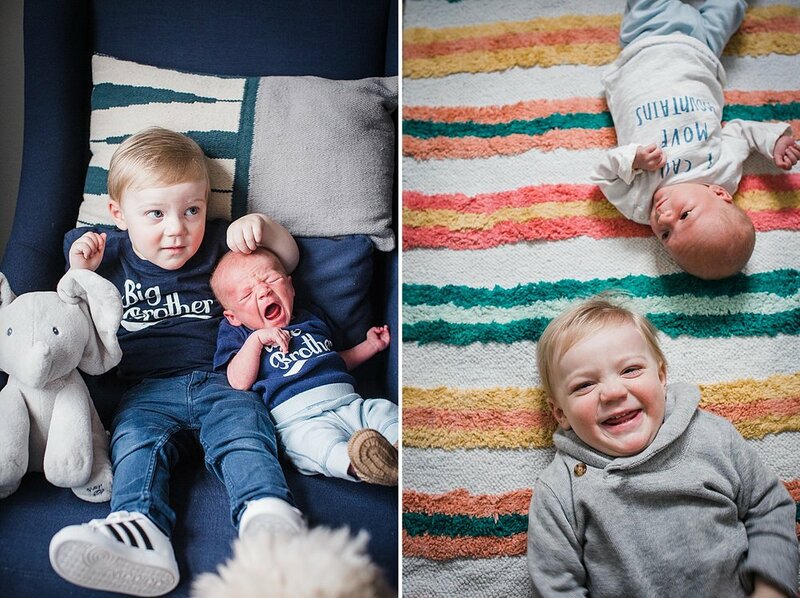 Even though I was exhausted the morning the photographer came and still feeling overwhelmed as a new mom of two, I look back at those photos fondly and I’m so glad we have them to treasure. When I think of the Chronicles of Narnia, I definitely imagine the snowy winter scenes in The Lion, The Witch and the Wardrobe. When I first spoke with Lexi over the phone about what she envisioned for her senior session, I knew it was going to be good. She is interested in film and she loves Lord of the Rings and Narnia so she had several ideas for how to incorporate her interests into this session. She wanted a wooded, forest setting with rocks and water and I knew right away that Tucquan Glen would be the perfect location for her senior session. 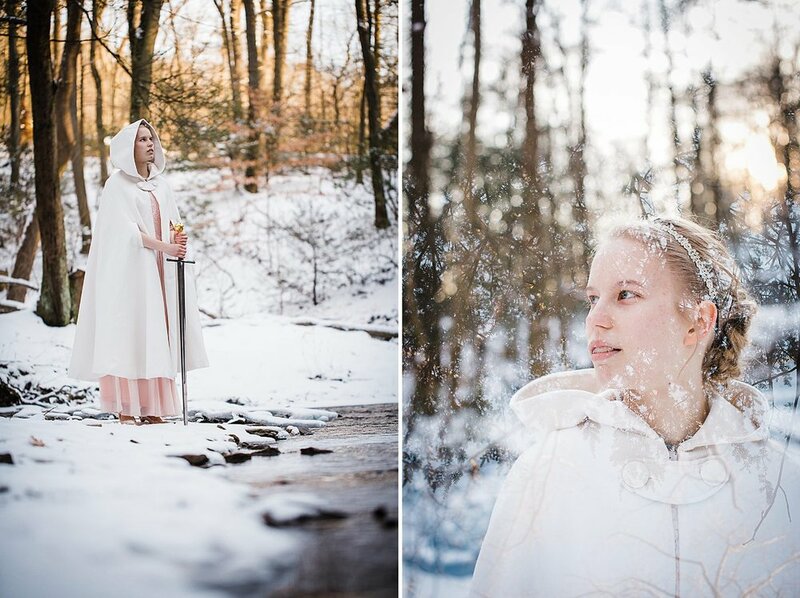 I am pretty sure this was the first time I did a senior session in the snow and it could not have been more perfect for creating that Narnia vibe. She even brought a sword and her bow and arrow along! Another unique addition to this session were some of Lexi’s closest friends. I loved having them along because they made her laugh and it made the cold a little more bearable. On my drive home I went by a sign that read, “Laughter is the sun that drives winter from the human face” and I thought it was the perfect sentiment for the day. I got to experiment with some double exposures and my new get fractals prisms as well on this shoot and I am happy with the results. 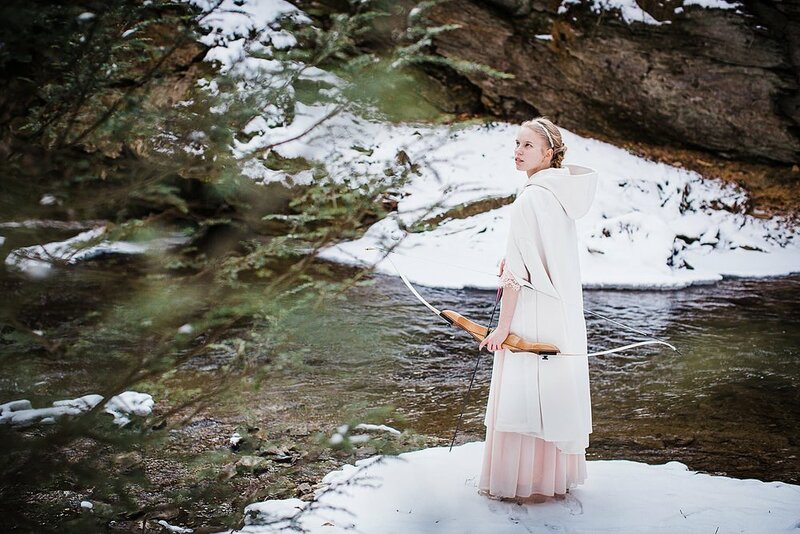 Hope you enjoy the photos from this snowy, winter senior session at Tucquan Glen! 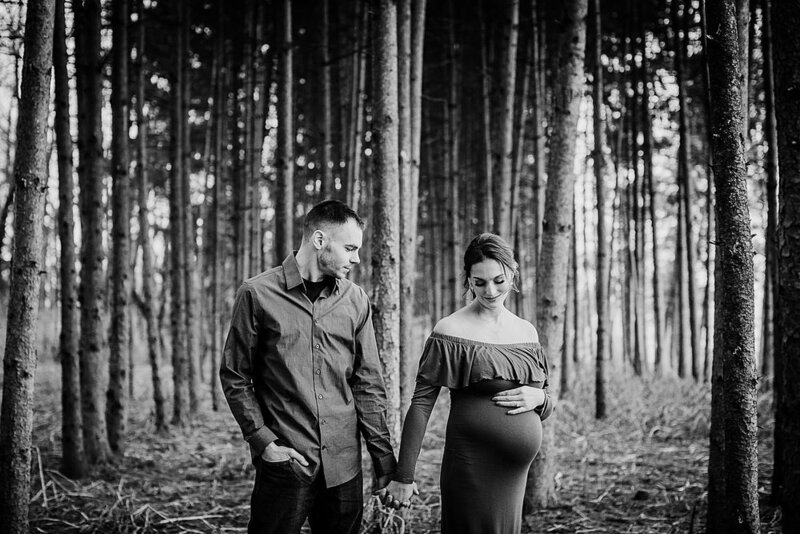 I adore meeting first time parents for maternity photography sessions because I get to ask them all about their plans for their soon-to-arrive little one. “Are you finding out the gender? What does the nursery look like? Where are you giving birth?”, etc. etc. 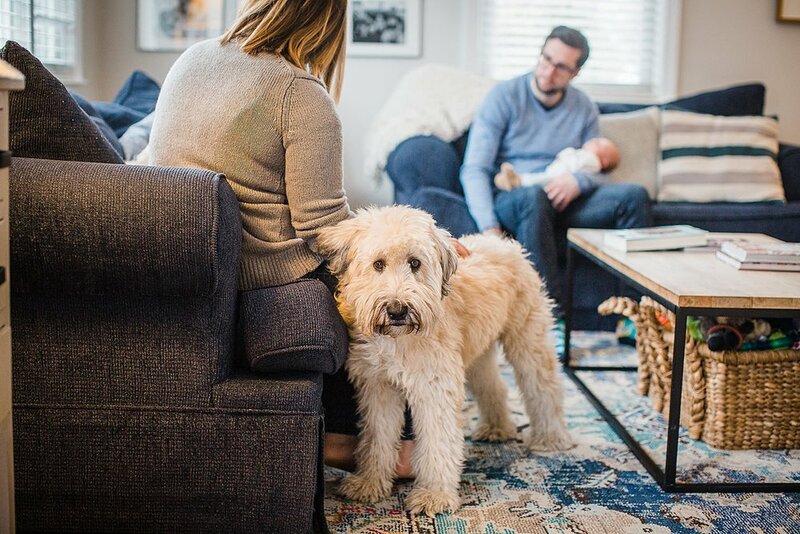 Yes, I admit I’m a little nosy and I probably offer some unsolicited advice but I have such fond memories of being pregnant with my first child and remember the anticipation and excitement about becoming a mom. I am a firm believer in photographing baby bellies so that moms can look back and remember that for those fleeting 9 months they carried and grew a tiny human. There is something pretty darn incredible and beautiful about pregnancy in my opinion! Sarah and Joe’s winter maternity session at Overlook Park was one of my first photo shoots of 2019. 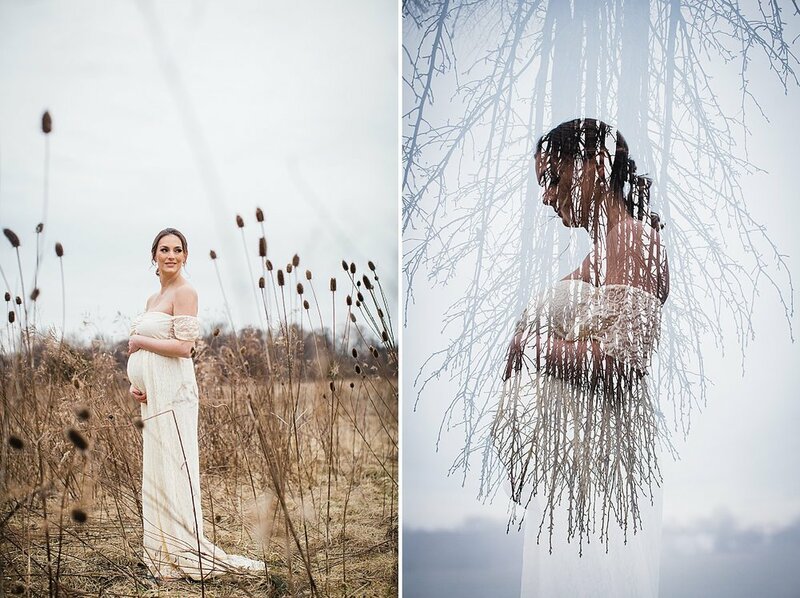 These two braved the frigid temperatures to get some beautiful photos in the fields and the pine forest. I was excited to play around with some double exposures for this session as well. They will be welcoming a little girl into their family before too long! And here she is, my favorite personal project of 2018, Mermaid Dreams. 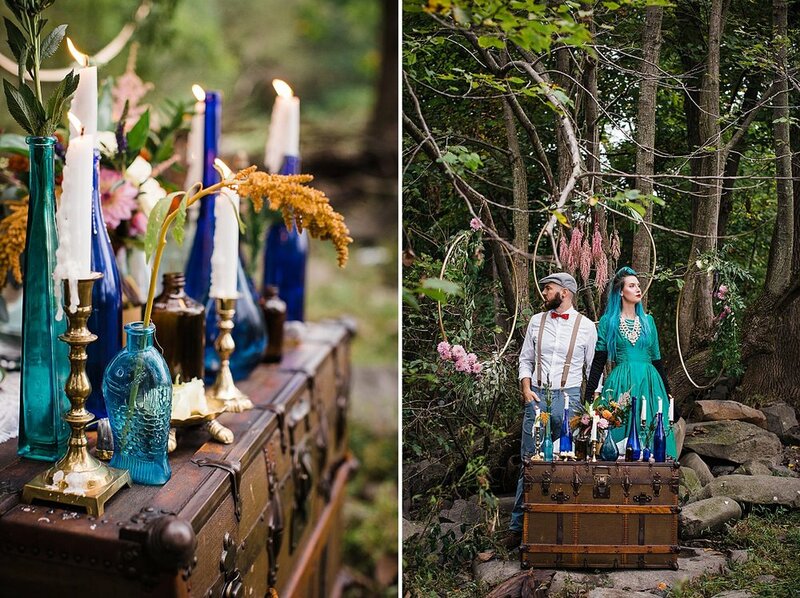 This creative jewel toned mermaid fantasy shoot has been brewing in my mind for quite a while. Seeing it all come together despite the odds is more than a dream come true for me. It is one thing to have an idea in your mind and it is a whole other thing to execute and bring to life, especially when it involves water and a handmade wooden strip canoe that has to be transported from point A to point B, a mermaid, candles and smoke bombs. Those who know me well would say that I am a mermaid at heart. I have always loved the water and Disney’s The Little Mermaid was my top favorite movie as a second grader when it came out in theaters. I was on the swim team in high school, water played a role in both of my children’s birth stories, and for my 35th birthday this year I bought myself a swimmable mermaid tail from Fin Fun Mermaid which we used for this photo shoot. 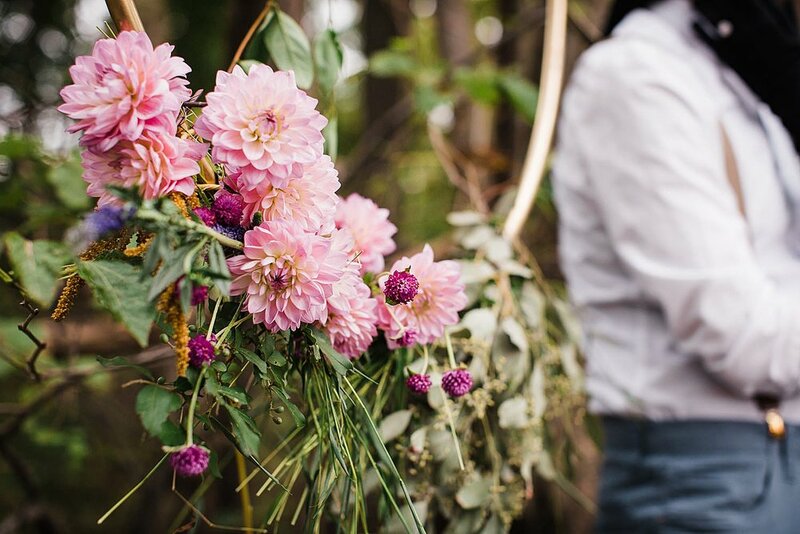 The collaboration with our amazing florist Kate of Glory Flower Co. and my fellow photog boss lady partner in crime Emily Wilcox of Emily Grace Photography was so much fun. And this shoot of course would not have been possible without our incredible models and creative duo Sirena and Chris of Monsters and Lace. I have never done a styled shoot like this before, and so it took quite a bit of organizing and Pinterest boards to bring it all together. I LOVE jewel tones and so I knew I wanted the colors to be rich and saturated in shades of turquoise, magenta, gold and cobalt blue. In hindsight we may have gone a little overboard with trying to do both a land scene and a water scene on the same day but it all worked out despite being a bit rushed at the end when it was getting dark (however it was perfect for our candles and lantern in the water). We originally planned to do the shoot on the Susquehanna River, but due to rains and flooding in the days before the shoot, the water was too high and fast for that. We ended up putting the boat in the tree line where it had flooded which worked perfectly to add a swampy, misty effect to the mermaid scene. Speaking of the boat, I am forever grateful to Lakefield Weddings for allowing us to borrow their wooden strip canoe at the last minute. It took some effort to transport (especially since I could not lift anything due to throwing out my back the week prior) but with some help we were able to load it on top of Emily’s dad’s car and get it to the river. 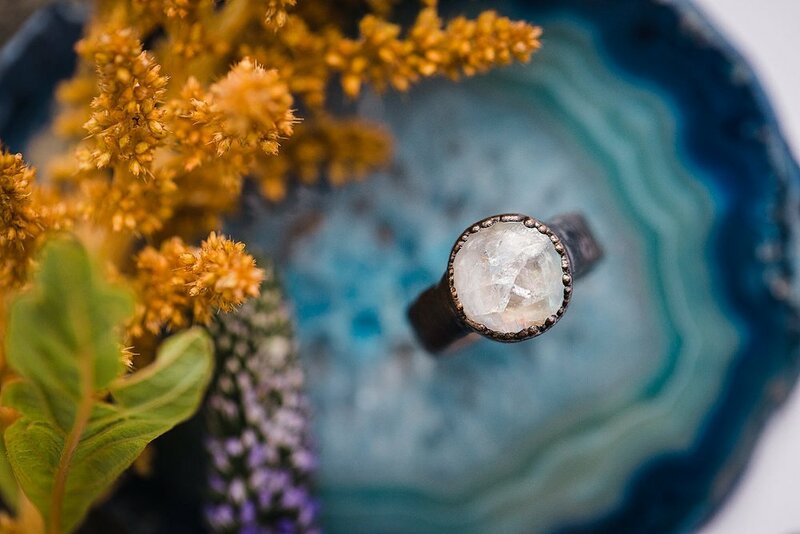 Geodes & Placemat Rentals | Keiser Rental Co.
A big part of the Christmas season for me is about giving (after all gifts are my top love language) and I have always wanted my business to give back in some way. A few years back, during the Syrian refugee crisis, a friend had the idea of getting photographers to offer their services while donating the proceeds to non profit organizations that were helping refugees. It was wildly successful and people not only got great family photos for their Christmas cards, they also felt good knowing their money was going to a good cause. This is the third year in a row that I have offered Christmas mini sessions for a cause and this year was the biggest year yet! I had so much demand for my first round of mini sessions that I decided to offer a second round. This year I chose a local cause, The Lancaster Neighbor Fund, which supports immigrants and their families who are vulnerable to deportation in the Lancaster area. I chose this cause because of my passion and concern for immigrant and refugee issues and because I know people and families who have been detained by ICE (Immigration & Customs Enforcement). I have also worked in the immigration program at non profit organization CWS Lancaster and understand the difficulties that many of these families face. I am happy to say that we raised $685 for the Lancaster Neighbor Fund through our mini sessions this year! The photos below are some of my favorites from our second round of mini sessions at Frey’s Greenhouse. It is impossible to leave Frey’s without feeling the Christmas spirit. Not only are their displays fantastic and festive, they have a fire pit outside where you can roast your own s’mores and free hot chocolate inside. They even had some vintage riding toys in the greenhouse that the kids loved. Thank you to all the families who came out for Christmas mini sessions! You can bet I’ll be doing it again next year. 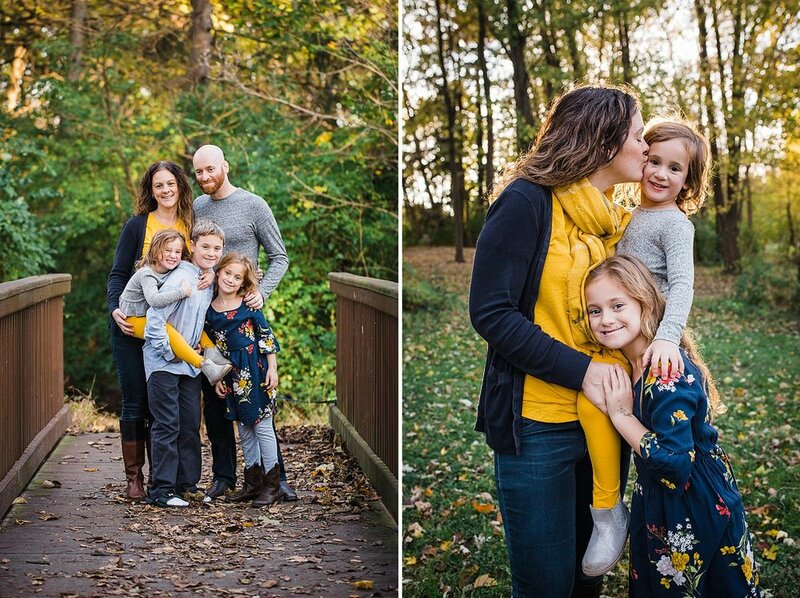 I’ve been photographing the Franz family for a few years now and this fall session at Long’s Park is probably my favorite session with them so far. In all my years of doing portrait photography, I have rarely used Long’s Park as a location. I’m not sure why that is because it’s a beautiful spot and there is quite the variety with the pond, foot bridges, trees and forest. This park has become my go to with my daughter, ever since she was a baby. In fact her first word was “duck” because she loved to see the ducks at Long’s Park. Fall came a little bit late this year and on this day the leaves were finally starting to show their true colors. There were countless other photo shoots going on at the same time and I was not surprised. The light was golden, the kids were happy, it was everything a photographer could want. If you know me, you know that I love hearing birth stories as well as sharing my own. Becoming a mom and growing a human is one of the most incredible journeys I have ever been on. Of course it would make sense that I love doing maternity and newborn photography for families. I get to play a small part in telling the story of growing families as they welcome their precious new babies into their hearts and their homes. This fall maternity session at the Historic Rock Ford Plantation in Lancaster is full of joy and smiles (other than the vicious mosquitos attacking us near the end). The light was golden, Sam was glowing, and I think the images speak for themselves. Baby Eck is supposed to make his/her appearance right around Thanksgiving and I am so looking forward to meeting (and photographing) their new little one.